A beautiful time of year to visit wine country. PLEASE NOTE: We are not holding a Grand Tasting or Educational Sessions in 2019. These events will return in 2020. Multi-course meals will focus on locally sourced ingredients that showcase the specially selected wines from each of the evening's participating winemakers. To book a Winemaker Dinner, or Special Tasting listed below you must call the Host of each event and reserve/pay with them directly, AVWA is not selling tickets. Alsace Celebration! You are invited to join the Handley Team for dinner in our cellar. The menu will include fresh & smoked salmon rillettes, frisée salad with homemade vinaigrette, potato & leek soup, duck leg confit with casserole beans & potatoes, and poached pear. The carte du jour will be prepared by Chef Marie, formerly of Coq Au Vin. Dinner includes wine pairings with each course. This dinner sells out quickly so make your reservations today. Hosted at the Boonville Hotel, an evening featuring an exciting collaboration of Navarro and Pennyroyal white wines. Paired with 5 inspired courses by new chef Perry Hoffman and team. Vegetarian option available. For information & reservation, call (707) 895-2210. You can speak to the innkeeper from 9-3 daily. Chef Matthew Kammerer of the Harbor House Inn, will be showcasing a 6-course tasting menu featuring locally-sourced coastal cuisine, paired with the exceptional wines made by winemaker Toby Hill. The intimate dinner will take place in Phillip Hill's iconic century-old barn in Philo, which was once used for drying apples. A portion of proceeds will go to Anderson Valley’s volunteer fire department. Enjoy a wide array of food offerings paired with white wines from Anderson Valley at various winery tasting rooms. Add live music and you have a bright winter weekend day. A special tasting of Roederer Estates sparkling line up matched with sushi (please note this is tasting not a meal). Enjoy library wines selected from our personal cellar, paired with artfully crafted small plates like crab bisque, curry chicken salad and a sweet treat to top it off! Chef Kim Badenhop will be on-hand with food & wine pairings tips and tricks for your future dinner parties. Come celebrate the beauty and bounty of Anderson Valley with us! Join us on Saturday and Sunday for our open house from 10am - 5pm. We will be having a special appetizer along with our full line-up of Brutocao Estate bottled wines. See you there. Join us for a vertical Estate Chardonnay flight from 2014-2017 paired with tasty bites both Saturday and Sunday! Come enjoy our estate-grown Sauvignon Blanc, Semillon (and Pinot Noirs), alongside a few treats from our library cellar! You are invited to join the Handley Team for Bubbles & Brunch where we will be pouring our 2016 Estate Brut Rosé alongside our Alsatian varietals: Riesling, Gewürztraminer, Pinot Gris and Pinot Blanc. 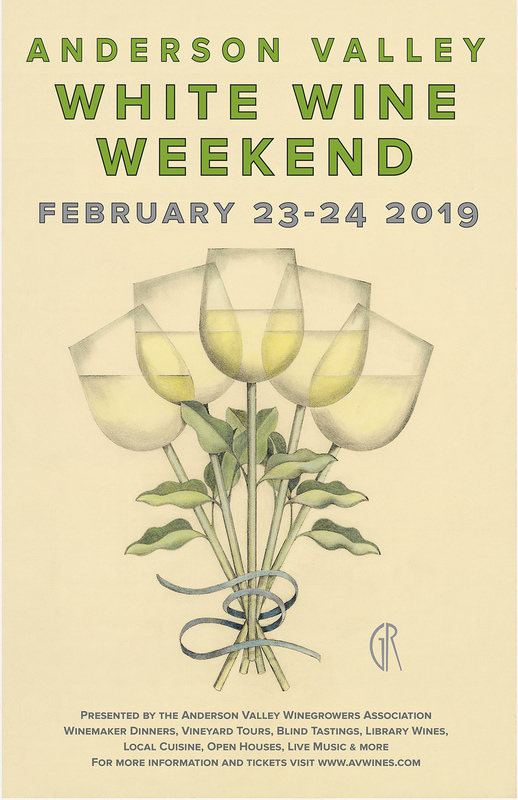 Celebrate the White Wine Weekend in Husch’s historic tasting room. Expand and test your wine knowledge with one of the many fun activities we will be hosting. Explore the aromatics of white wines with a hands-on aroma exercise. Challenge your palate with “Guess that Wine” featuring a mystery wine for you to solve. Relax and enjoy a sample of specially selected cheeses with your complimentary white wine flight. After your tasting, take a self-guided tour through the vineyards. We look forward to seeing you. Gewürztraminer, Pinot & Pizza…take a detour off Highway 128 just outside Philo and meander up our dirt road and across three wooden bridges to our tasting room…you’ll taste our wines perfectly paired with pizzas from our wood-fired oven. Take 20% off all wine and merchandise. We are serving Salmon Tartlets, with smoked salmon, capers, herbs, crême fraîche, and lemon zest. Special bites to pair with our award-winning Dry Gewürztraminer, and lightly oaked Chardonnay. All wines will be available for tasting both Saturday and Sunday. Pet-friendly! Come by the Maryetta tasting room to sample our first ever release of our White Pinot Noir. Anderson Valley white wine food and wine pairings in the tasting room over the weekend. Join Toby and Natacha for our Food and Wine Open House Party! Experience the "tartine flambée" a traditional dish from Alsace paired with our white wines and Pinot Noir. Sunday hours: 11am to 5pm. White wine discounts and food pairings in the tasting room over the weekend. 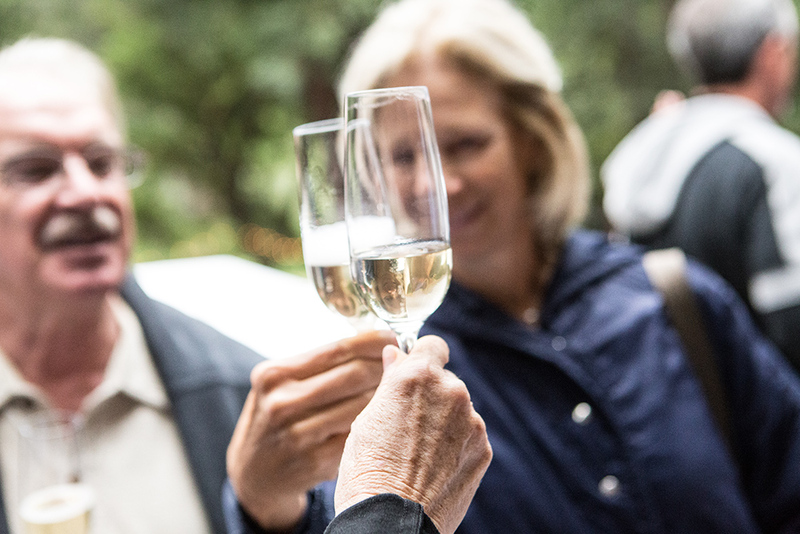 Come celebrate white wine with us this weekend in the Anderson Valley. We're offering 25% off on our 2017 Filigreen Farm Pinot Gris, Anderson Valley. Guests purchasing 12 bottles or more will receive 2 vintage wine glasses (until supplies last) selected from our Smith Story Sundries shelves. All of our white wine offerings will be flowing + rosé all weekend! Stop by Toulouse Vineyards to try our mouthwatering white wines as we fire up the grill for some tasty Brats served with fennel-apple slaw as well as other tasty treats! Pet-friendly!